Change default weight settings, separate points as in the language settings and add weight units ! What does the ocmod do? - It will add " g" to the weights used in the cart and checkout so your customer will know the weights are in grams. 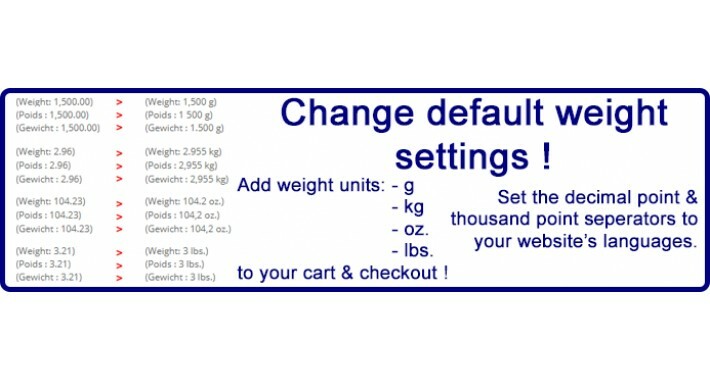 - It will add " kg" to the weights used in the cart and checkout so your customer will know the weights are in kilograms. - It will add " oz." to the weights used in the cart and checkout so your customer will know the weights are in ounces. - It will add " lbs." to the weights used in the cart and checkout so your customer will know the weights are in pounds. How to install? These ocmods are very simple to install. 1. Go to your admin > Extensions > Installer. 2. Go to your admin > Extensions > Modifications. Go to Log and clear the log by using the red button "Clear". Press the "Refresh" button at the top. Check the log to see if the ocmod is installed. ¡¡¡ This is a free extension. Help orphans (6 - 15 years) in Northern Thailand !!! We are supporting them with offering English lessons and learning materials. Help us, giving these orphans a (better) future.